Sorrento is a town located on the Circumvesuviana rail system making it easily accessible from Naples. It's also a great base for exploring many attractions in the area including Pompeii and Ercolano. It's also connected to Capri by ferry. The town itself has beautiful architecture, quaint cafes, and excellent restaurants. There's also a lot of shopping areas that cater specifically to tourists. 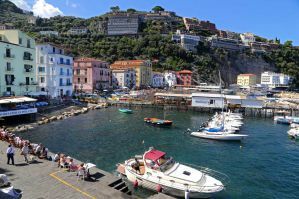 If you're traveling alone to Sorrento, or even if you're traveling with friends, hostels are a great option for affordable accommodation with a fun atmosphere. If you're on a budget and want to stretch your dollar, there are a couple of hostels in the area that may meet your needs. 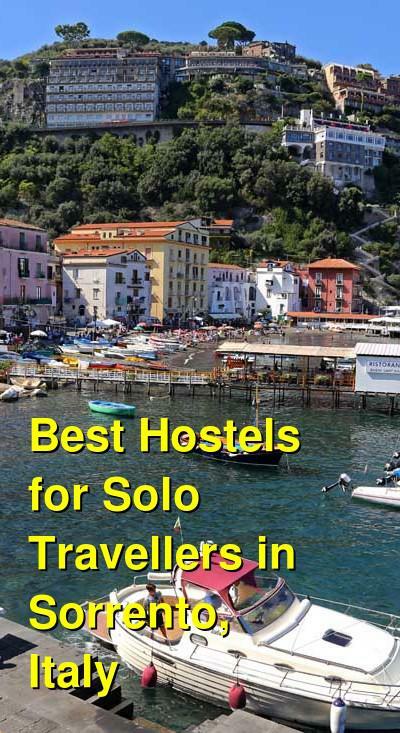 How much do hostels in Sorrento cost? The Florida Hostel and Hotel is a unique option for travelers who want comfort and modern amenities without spending a fortune. It's a nice resort facility that has a beautiful setting and a lot of amenities for guests. There is a traditional citrus garden on the grounds that adds to the character. It has a fun atmosphere and a social setting where it's not hard to meet other guests and make a few friends. There's a swimming pool and bar area where many guests enjoy relaxing. There are also the standard amenities available including wi-fi, security lockers, luggage storage and travel information. This is great place to base yourself while you're in the area. The staff can help with all kinds of travel arrangements including organizing trips to Capri Island, Positano, or along the Amalfi Coast. The hostel if a great place for solo travelers who want to meet other guests. They host a pizza night every Thursday night and there is a full breakfast available. It's a fun option if you're looking for a relaxing but social setting in Sorrento, Italy. The Sirens is a hostel in the middle of Sorrento. It's conveniently located just five minutes from circumvesuviana and is located in a newly renovated building with many modern amenities. There's a shared kitchen available to guests so it's easy to prepare your own meals if you're on a particularly tight budget. There is also internet access available throughout. If you're traveling alone, there are plenty of common areas where you can meet other guests. The hostel has a game room as well as a bar where you can hang out and relax after a busy day exploring the area. The bar, "The Cafeteria", is open to the public, so it attracts tourists and locals from the area. Both private rooms and dorms are available. If you're traveling alone and want a little privacy, there are private single rooms you can stay in. There are also private doubles as well as dorms that sleep either four, five or six guests. Just outside of Sorrento, Resort Campogaio is a campground with a beautiful setting and a gorgeous view looking out over the Gulf of Naples and Mount Vesuvius. It's in a quiet residential area and is surrounded by olive trees, lemon trees, and old oak trees. It's a unique way to experience the Mediterranean setting. Public transportation connects the campground to the town and other nearby attractions. The campground has an outdoor swimming pool, and many amenities that you would expect at a hostel. You can relax under an umbrella and soak up the natural setting. There's also a rocky beach nearby. The campground regularly organizes entertainment for guests. Although many activities are popular with children, there are still fun things to do for young adults. It's a nice place to sit back and relax in the Mediterranean climate with a glass of limoncello. It's also possible to organize trips to many of the nearby sights and attractions. There are a range of accommodation types available including cabins, tent cabins, and personal tents. Cabins sleep two or three people and some have attached bathrooms. Tent cabins have shared bathrooms and are smaller than the cabins. Tent camping is the most affordable option. Although not your traditional hostel setting, Resort Campogaio, is a unique and fun way to experience the Sorrento area. If you're traveling alone, it has a fun atmosphere where you can meet all types of other travelers including families, small groups, and other young backpackers. There are all sorts of activities including volleyball, tennis, and swimming available. Laundry facilities and are also available. Its a fun place to enjoy an outdoor setting just outside of town.